1. During the course of negotiations between an exporter and an importer for the supply of goods, the importer asks for credit terms. Whether the importer’s obligations will be guaranteed by a bank, and if so, who? 3. The forfaiter provides the exporter with an indication of the costs involved. At this stage neither party is committed in any way. 4. When the details of the commercial contract have been agreed, but usually before it has been signed, the exporter asks the forfaiter for a commitment to purchase the debt obligations (bills of exchange, promissory notes etc) created under the export transaction. 5. The information required for this is the same as for an indication. The details of the underlying commercial transaction. The nature of the debt instruments to be purchased by the forfaiter. 7. The exporter signs the commercial contract with the importer and delivers the goods (2+3). 8. In return, if required, the importer obtains a guarantee from his bank (4) provides the documents that the exporter requires in order to complete the forfaiting (5). This exchange of documents is usually handled by a bank, often using a Letter of Credit, in order to minimise the risk to the exporter. 9. The exporter delivers the documents to the forfaiter who checks them and pays for them as agreed in the commitment (6+7). 10. Since this payment is without recourse, the exporter has no further interest in the transaction. 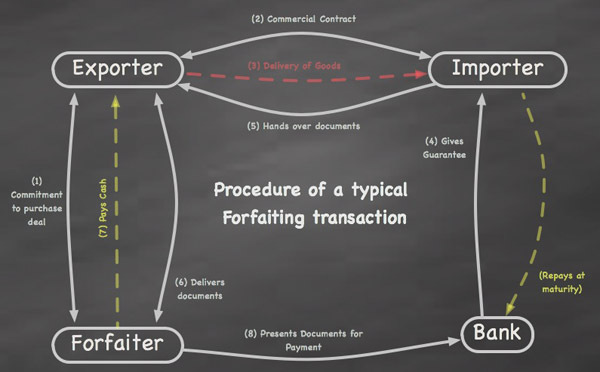 It is the forfaiter who collects the future payments due from the importer (8) and it is the forfaiter who runs all the risks of non-payment.